Objectives: The best treatment for end-stage renal disease is kidney transplant, but the shortage of donor organs has caused long waiting times for an appropriate organ allograft. The use of ABO-incompatible kidney transplant can be a valuable option to expand the donor pool. The purpose of the present study was to evaluate 13 patients who had successful ABO-incompatible kidney transplant with double-filtration plasmapheresis and rituximab. Materials and Methods: From January 2011 to August 2012, there were 13 patients who had ABO-incompatible kidney transplant. Antibody titers were monitored during preconditioning and after transplant. Preconditioning protocol included rituximab, mycophenolate mofetil, tacrolimus, corticosteroids, double-filtration plasmapheresis, and intravenous immunoglobulin. Results: There were no episodes of acute T-cell or antibody-mediated rejection. There were no surgical complications except postoperative bleeding in 1 patient. Mean serum creatinine at 2 weeks after transplant was 71 ± 18 μmol/L (0.8 ± 0.2 mg/dL). At mean follow-up 267 days (range, 1-19 mo), there was no graft loss or patient death. Conclusions: The ABO-incompatible kidney transplants were successful after the preconditioning protocol that included double-filtration plasmapheresis and rituximab. The use of ABO-incompatible kidney transplant may increase the availability of kidney transplant and avoid or shorten dialysis. Future multicenter studies are justified to develop a standardized preconditioning protocol. The purpose of the present study was to evaluate 13 patients who had successful ABO-incompatible kidney transplant with double-filtration plasmapheresis and rituximab. From January 2011 to August 2012, a total of 102 recipients had kidney transplant, 60 from living donors and 42 from deceated donors in Keimyung University Dongsan Hospital. There were 13 patients (21% of living donor transplant) who had ABO-incompatible kidney transplant. Preconditioning protocol included rituximab (200 mg/m2) and mycophenolate mofetil (body weight > 60 kg, 2.0 g/d; body weight < 60 kg, 1.5 g/d) given at 2 weeks before transplant (Figure 1). In addition, tacrolimus (0.1 mg/kg/d) and corticosteroids (0.5 mg/kg/d) were started 10 days before the operation. Double-filtration plasmapheresis (Plasauto EZ, Asahi Kasei Medical, Tokyo, Japan) was started 10 days before transplant and was performed until anti-A or anti-B antibody titer was < 1:8. The processed plasma was 1.5 or 2 total plasma volumes, and replacement included 250 mL of 5% human albumin and 0.9% normal saline. At the final plasmapheresis session before transplant, plasma exchange was performed with fresh frozen plasma (AB blood group). Intravenous immunoglobulin (100 mg/kg) was given after each double-filtration plasmapheresis session (Figure 1). 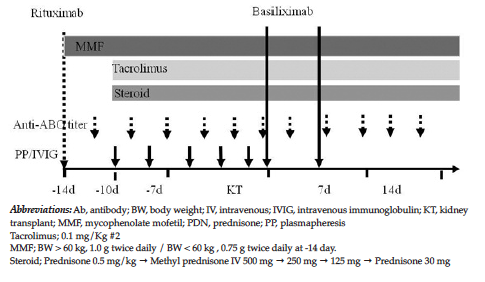 Baxiliximab was given at operation day and 4 days after transplant as induction. After transplant, the anti-ABO antibody titer was monitored weekly. Posttransplant plasmapheresis was indicated to eliminate the rebounding antibody level when posttransplant anti-ABO antibody titer was > 1:8 during the first week or > 1:16 during the second week. There were 13 ABO-incompatible kidney transplants performed (Table 1 and 2). In the 13 transplants, donor and recipient blood group types were donor type B to recipient type A (4 transplants), A to O (3 transplants), B to O (2 transplants), AB to B (2 transplants), AB to A (1 transplant), and A to B (1 transplant). There were 12 primary transplants and 1 revision transplant. Mean initial ABO antibody titer (immunoglobulin G) before plasmapheresis was 1:42 (range, 1:2 to 1:128) and patients had mean 3.9 pretransplant double-filtration plasmapheresis sessions. Double-filtration plasmapheresis was not performed in patents who had a low ABO antibody titer (< 1:2). The pretransplant mean ABO antibody titer (immunoglobulin G) was 1:2 (range, 1:1 to 1:8). There were no episodes of acute T-cell or antibody-mediated rejection. No additional plasmapheresis was performed after transplant. There were no surgical complications except postoperative bleeding that necessitated transfusion in patient No. 1. 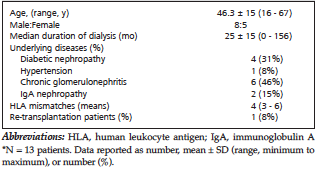 Mean serum creatinine at 2 weeks after transplant was 71 ± 18 μmol/L (0.8 ± 0.2 mg/dL). At mean follow-up 267 days (range, 1-19 mo), there was no graft loss or patient death. There were 2 patients who had special situations. Patient No. 5 had ABO-incompatible kidney trans-plant without double-filtration plasmapheresis because her preoperative anti-ABO antibody titer was 1:1. Patient No. 7 was highly sensitized, and his first kidney transplant in October 2004 was complicated by graft failure after 4 years; the revision kidney transplant was an ABO-incompatible transplant, and preoperative panel reactive antibody was 80%. Both patients had successful ABO-incompatible kidney transplant without rejection or complications. In the past, ABO-incompatible kidney transplant was an absolute contraindication for organ transplant.2 However, the frequency of ABO-incompatible kidney transplant has increased because of improved understanding and treatment of immunologic factors.8 During preconditioning, the isoagglutinin titer against the donor was a major factor for rejection, and an antibody depletion technique was used.9 We used double-filtration plasmapheresis because this is a safe and effective method, no coagulation factors are eliminated, and large plasma volumes may be passed.10 In the present study, double-filtration plasmapheresis was effective at decreasing the ABO antibody titer (immunoglobulin G) before transplant. When the recipient’s blood group antibody titer was low, no pretransplant antibody-reducing regimen was used, and this approach has been effective. There are no standardized preconditioning protocols available, and many transplant centers have used their own independent desensitization protocols.11 In the present study, we used rituximab, double-filtration plasmapheresis, low-dose intra-venous immunoglobulin, and immunosuppression with tacrolimus and mycophenolate mofetil. The present results were limited because the long-term outcome of ABO-incompatible kidney transplant is unknown, but we showed that ABO-incompatible kidney transplant can be performed successfully after a preconditioning protocol. The use of ABO-incompatible kidney transplant may increase the availability of kidney transplant and avoid or shorten dialysis. Future multicenter studies are justified to develop a standardized preconditioning protocol. Wolfe RA, Ashby VB, Milford EL, et al. Comparison of mortality in all patients on dialysis, patients on dialysis awaiting transplantation, and recipients of a first cadaveric transplant. N Engl J Med. 1999; 341(23):1725-1730. Hume DM, Merrill JP, Miller BF, Thorn GW. Experiences with renal homotransplantation in the human: report of nine cases. J Clin Invest. 1955;34(2):327-382. Alexandre GP, Squifflet JP, De Bruyère M, et al. Present experiences in a series of 26 ABO-incompatible living donor renal allografts. Transplant Proc. 1987;19(6):4538-4542. Takahashi K, Tanabe K, Ooba S, et al. Prophylactic use of a new immunosuppressive agent, deoxyspergualin, in patients with kidney transplantation from ABO-incompatible or preformed antibody-positive donors. Transplant Proc. 1991;23(1, pt 2):1078-1082. Tanabe K, Takahashi K, Sonda K, et al. Long-term results of ABO-incompatible living kidney transplantation: a single-center experience. Transplantation. 1998;65(2):224-228. Takahashi K, Saito K. ABO-incompatible kidney transplantation. Transplant Rev (Orlando). 2013;27(1):1-8. Shin M, Kim SJ. ABO incompatible kidney transplantation - current status and uncertainties. J Transplant. 2011;2011:970421. Magee CC. Transplantation across previously incompatible immunological barriers. Transpl Int. 2006;19(2):87-97. Tuncer M, Yücetin L, Tekin S, Demirbas A. ABO-incompatible kidney transplantation: first cases in Turkey. Transplant Proc. 2012;44(6):1703-1705. Higgins R, Lowe D, Hathaway M, et al. Double filtration plasmapheresis in antibody-incompatible kidney transplantation. Ther Apher Dial. 2010;14(4):392-399. Montgomery JR, Berger JC, Warren DS, James NT, Montgomery RA, Segev DL. Outcomes of ABO-incompatible kidney transplantation in the United States. Transplantation. 2012;93(6):603-609. Acknowledgements: The authors have no conflicts of interest to disclose, and there was no funding for this study.